“Music has formed a part of the tradition of our parish from the day [the Church of the Redeemer] was founded. 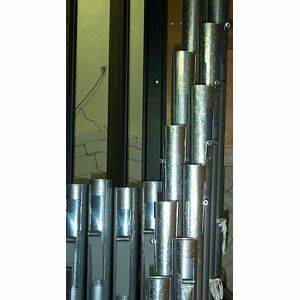 The original pipe organ by today’s standards would be looked upon as archaic. Operated as it was, by water power, we can well imagine the difficulties that must have been experienced by those who were responsible for the music of the Church. Countless stories exist to tell of those trials and tribulations. The Church of the Redeemer’s principal instrument is a Schantz Organ installed in 1989. It is an electro-pneumatic organ with a detached console. It has two manuals (Compass CC to C4 … 61 notes), pedals (Compass CCC to G … 32 notes), and stop and coupler control (Tilting Tablets above the Sweel Manual). Although not a large pipe organ by some standards, it is an extremely versatile instrument in a marvelously acoustic setting. 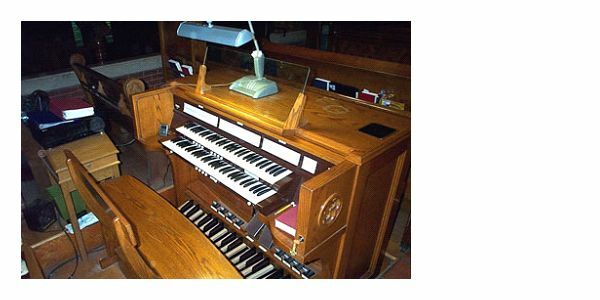 The current organ, designed, built and installed by the Schantz Company of Orrville, Ohio in 1989 is a two manual, 19-rank electro-pneumatic instrument with 27 voiced stops. Pictured here are trumpet pipes in the swell box. The Great and Swell manuals and the fliptabs for setting stops. The Swell bellows and tremolo, operated from the fliptabs on the console. The pedal board and toe studs on the console. The mouths of three Bourdon pipes.